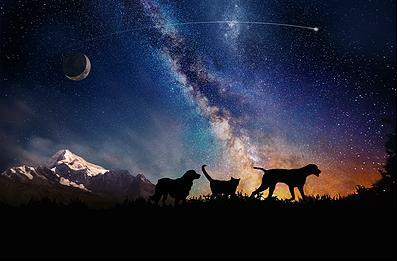 Houston-based Celestis, Inc., which since 1995 has sent cremated human remains on trips to outer space and back (including those of “Star Trek” creator Gene Roddenberry), announced this week that its new Celestis Pets spinoff, launching this fall, will provide the same service for dearly departed dogs and cats. While the “Luna” trip to the moon will cost at least $12,500, more affordable round-trips into orbit will be available for $995 and up. A portion of the proceeds will be donated to the non-profit Rescued Pets Movement. One gram of your dog’s cremated remains, or a lock of his hair, will be sent into space in an individual capsule on a commercial launch vehicle. “All of our pet pioneers will fly with science experiments and spacecraft that advance human knowledge and protect the planet and its living creatures,” according to Celestis Pets. Afterward, you’ll receive a certificate verifying that your dog completed the spaceflight. The first departed dog departing on the inaugural flight this fall will be Apollo (seriously, that was his name), a blue merle Australian shepherd. For more information on how to one day send your dog to space, the moon or beyond, visit the Celestis Pets website.